Ah, the grand masters of the Intellivision - or so they thought. Those upstarts Imagic and Activision gave Mattel strong competition in showing what the machine's capabilities were. Just at the end of the Intellivision's lifetime at Mattel, some of their best work emerged - even if Mattel didn't finally deliver all of the games themselves (e.g. Thunder Castle, Thin Ice, All Star Major League Baseball (World Championship Baseball)). Note: Games developed by Mattel, but released by INTV Corp. are listed on the INTV page. Note: This count excludes test and demo carts. 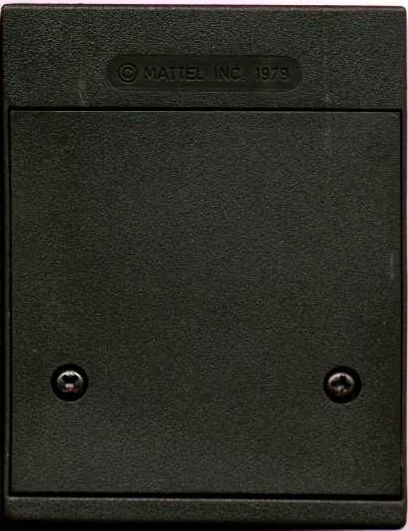 The Mattel game list is broken into the Networks used to organize the games. The later games, released in 1983, were not in any networks, so they are listed separately. The Intellivoice games have their own category, as does software released for the Entertainment Computer System. Rounding out the groupings, we have the vary narrowly released Keyboard Component software and the short-lived—and ahead-of-its-time—PlayCable releases. One thing I've noticed is that Mattel revised its game manuals with some regularity in good times - especially on popular games. Of particular interest to me are the early, early games that shipped with full color manuals. When we first got our original system, we had a total of 5 games: Las Vegas Poker & Blackjack (the pack-in game), Major League Baseball, NFL Football, Space Battle, and Math Fun. Every single one of these games came with full-color manuals. When we got Armor Battle several months later, it seemed extremely strange that the manual was this odd monochrome thing. It turns out that an earlier color version of this manual was printed. I first learned of this at the Intellivision Gumbo web site's manuals section. It appears that in most cases, the revision of a manual occurred to update the replacement overlay order form on the last page of the manual. Revisions were denoted by appending a letter in parentheses after the part number - for example, 2610-9020(A) vs. 2610-9020(C) for different revisions of the NFL Football manual. In some cases, though, the actual documentation had to be revised. For several games, actual running changes to the game required changes to the documentation. One example is the manual for Auto Racing, due to the changes to steering. Another possibility (still not confirmed) is the change to answer entry order for Math Fun. The list of variations in overlay order forms at the back of various manuals can be found by following this link, or for specific revisions mentioned in the comments on the game list pages, by following the particular link. It was compiled simply by examining the manuals I own. It appears that once the game library became overly large, Mattel simply dropped the order form altogether. This was not long after the Space Network games were released. One of the coolest features of the Intellivision system was that every game (initially) came with custom overlays. Their artistry ranged from utilitarian to whimsical to downright beautiful. Later, third-party vendors cut costs by skipping overlays (Coleco) and after the crash, they became scarce. In addition to revising manuals, it seems that overlays were updated sometimes, too. Many of the revised ones are from the early sports games - NFL Football, Major League Baseball, and NBA Basketball. These overlays dropped their licensed logos (NFL, Major League, NBA) in later revisions. The Intellivision Gumbo web site's overlay section and SteveR's pages have the most complete list of these kinds of variations I've found (other than my own). Ever notice the evolution of the Mattel Intellivision cartridges' physical packaging over time? In the beginning, we had full color manuals and heavy-duty overlays. The backs never scratched off unless you beat the hell out of them, and even then, the text seemed permanently part of the mylar. They used gatefold boxes with white plastic trays to store the cartridges. The oldest cartridges did not have the "INSERT TO THIS LINE" line on them. Only the oldest didn't have this. Virtually everything else does have the "INSERT TO THIS LINE" line. In addition, you could open a game cartridge with a Philips screwdriver and look at its guts. 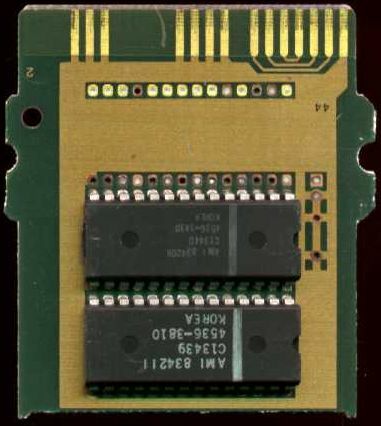 The ROMs were protected by thick metal casing soldered to the PCB to which the chips were soldered - only the edge of the cart that plugged into the unit was visible. 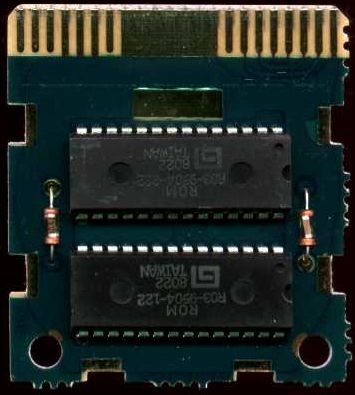 Due to the heavy shielding (like what you find around the main logic board in the 2609 and 3504), the early Intellivision carts had some heft to them. Maybe Mattel saw this as a selling point - "Our carts weigh more than an Atari cart because there's so much more game in there!"? 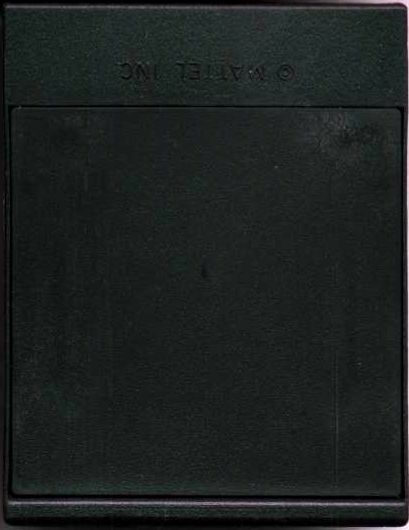 The next generation of "printings" of the cartridges had the monochrome manuals. The games that licensed trademarks, such as NFL Football, dropped the logo from the overlays and nearly eliminated references to the licensed property in the manual and on the overlays. In NFL Football's manual, NFL was often replaced with Pro, or dropped altogether. The overlays were manufactured more cheaply, with backing that was no longer smooth, but rough - and it scratched off easily. Our Sea Battle cart suffered that fate almost immediately. 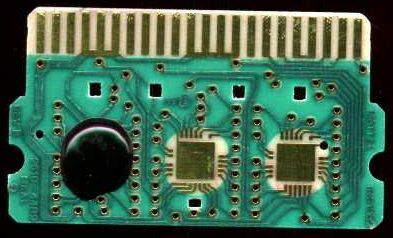 The carts lost the metal shielding around the ROMs on the PCB, and some carts started using triangle-headed screws. Guess those curious youngsters were opening up the carts too often - and of course, the metal shielding protecting the chips was gone, too. Who knows the havoc that may have ensued? The third generation of carts kept the same plastic casing, cheaper overlays and manuals, but the plastic tray in the cartridge box was lost. Now, games just rested in a small opening directly in the cardboard. 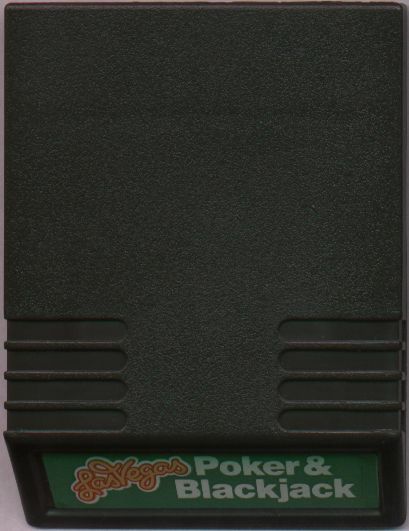 A mutant version of these boxes was used for the Intellivoice games, which had a fancier pocket to store the manual, a slot specifically designed to hold the overlays, and shiny gold labels for the carts. Foreign markets also received special attention - to varying degrees. Here is a list of the specific countries that Mattel localized the manuals and possibly boxes for to some degree. This list may not be completely accurate - so feel free to contribute! The entries for Spain and Mexico are speculative - confirmation would be most appreciated. Some foreign-market releases had slightly different versions of the boxes - typically the boxes for licensed properties were released abroad sans license or logo (e.g. Football rather than NFL Football or Backgammon rather than ABPA Backgammon). In one case, a game was actually renamed - Checkers became Draughts in the U.K. English markets. 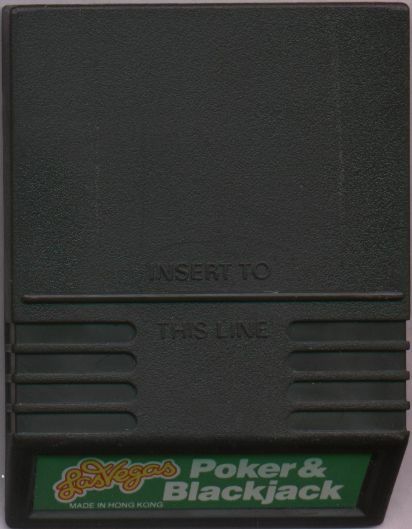 A general pattern was followed for the European mainland, where a localized manual was slipped into slots cut into the back of the box. Later, localized manuals were just shrink-wrapped to U.S. versions of the boxes. I suspect that France often got the French-Canadian versions of Mattel games, with occasional 'mainland Europe' style versions as well. Still, a number of manuals exclusively in French have been found. I've only seen one Spanish translation - for Chess, of all things, so I can't say how much went on for Spanish-speaking lands. A small number of games were released in the European market using a colorful, multilingual packaging style that was quite distinctive - and pleasing! These games were: BurgerTime, Shark! Shark!, Vectron, and Mission X. Each contained a single manual in English, German, French, Italian, and Spanish. I'm missing several of these (indicated with an asterisk (*)), so if you have any available, or know of more to add to the list let me know! At the very end, another round of changes took place - in several different ways yet again. The boxes were replaced with the "Atari-style" in which you simply opened the bottom flap to get the game out. Gone was the sophisticated, elegant book-like box. I haven't seen any localized versions of these boxes. 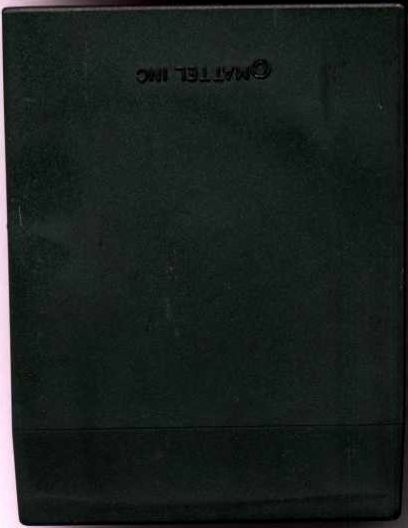 At least two more variations on the cartridge casing were made as well. First, the screws went. Instead, the "door" just snapped onto the bottom of the cartridge. 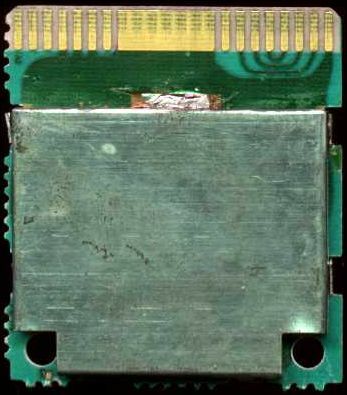 Then, that entire concept was abandoned in favor of a single piece of plastic molded to be the same shape as the original cartridge cases, but with no door - the PCB held into place by a piece that snapped into the open end of the cart. The PCB, still having one or two chips soldered onto it, slid into a slot in the casing, with an enclosure to snap onto the end. Somewhere along the line, the PCBs stopped having diodes or capacitors wired onto them. Was this ROM-dependent? The final PCB variation I've seen is one in which surface mount technology was used to drop a chip onto a PCB about 1/3 the size of the originals, with a dollop of plastic or epoxy dropped over top. This pint-sized PCB also slid into a slot. Interestingly, a "protector" was added to prevent you from seeing into the guts of the cart. It appears that you could put up to three chips on this PCB. Was this what was used for the "album" carts, like Triple Challenge and the Learning Fun I and Learning Fun II carts? Of course, once Intellivision, Inc. took over, and subsequently INTV, you received black and white manuals on cheap paper stock. Overlays also disappeared from the games. At one point, they actually shipped games in plastic baggies rather than boxes! On the up side, perhaps these cost-cutting measures perhaps helped extend the life of the Intellivision just that much longer! 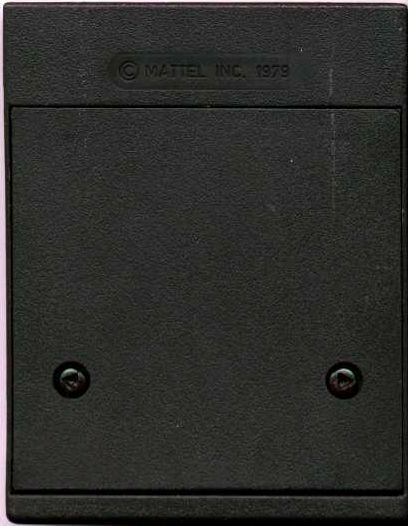 The following items are still missing from the Mattel Electronics part of my collection. Intellivision II Test Cart This would be very handy! Demo Cart III International demo cart from 1982 - green box? Demo Cart IV U.S. 1983 demo cart with "collapsing Lupin" Lock 'N' Chase demo? box color?